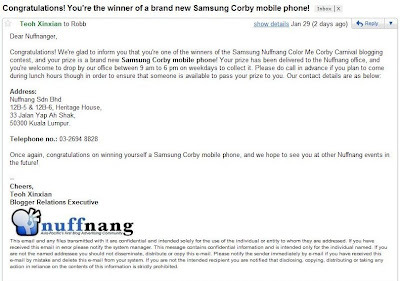 Home blog carnival email events heritage house journey NuffNang samsung Corby I won a Samsung Corby from Nuffnang! The title says it all~!... I never thought of winning in the first place! 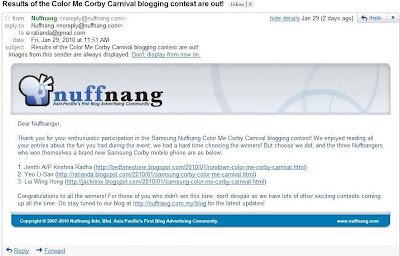 I just wanted to share my experience and how I really truly feel when I was invited to the Samsung Corby "Color Me Carnival" event! Even though I didn't win that day, I never felt any loss too. Because that day, like I said, I met lots and lots of cool and awesome people and all bloggers from Nuffnang! When I received this email, I first though - Is this for real?!?!?! Eh babe, on the warranty card right, I wonder if it's okay that we don't have a dealer stamp on it? I forgot to ask NN when I went over that day. Hehe.